Most problems have a solution, and garage door malfunctions are no exception. Some issues require a professional repair service whereas you can troubleshoot others before contacting a technician. Read on for some of the common problems our garage door owners experience. At some time or another, most electric garage doors are likely to face the problem of not opening or closing. This can relate to many issues, often tied in some way to the opener. We recommend trying initially to reprogram the opener by referring to your owner’s manual. If you still can’t resolve the problem, get in touch with us to come and inspect the issue. Until then, you can always use a manual temporary fix to get your door open and shut by pulling the manual release cord. Again, consult your owner's manual if you're not sure how to do this. Another common issue when opening or closing the door, it that it gets stuck in the middle. This could be a sign that the moving parts need to be lubricated. Try to use a garage door lubricant on the rollers, springs and hinges. It attracts less grit and dust. Just make sure you use the right substance for your garage door material if you do this. If in doubt, just give us a call for advice! 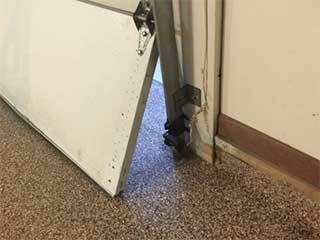 If every now and then your door gets stuck during operation, it could be due to loose garage door parts. It's worth going through the system and ensuring that all screws, nuts, and bolts are tightened sufficiently. You should also check for any blockage in the track which could be causing your system to work harder than it needs to. If your track is a little bit bent, it may be possible to try and knock it back into position with a hammer - if it the denting is significant though, please look for professional assistance. This is a classic signal that something is going on with the opener sensors, these components are designed to send a message to the opener in the event that something gets in the way of the door when it was closing. If this reversal happens when there is nothing in the door's path, it may be worth cleaning the sensors of any dirt which could be interfering with their functionality. If these methods haven't resolved your issue, you're likely to need more specialist assistance. Our experts at San Tan Valley in Arizona can help, just give us a call!